I have a thing when it comes to my everyday drinking water since I drink at least 4 to 5 glasses a day. It's not a BIG thing. More like...a common sense thing. I like my drinking water to be CLEAN! I.E. Nothing floating around that's visible to the naked eye. 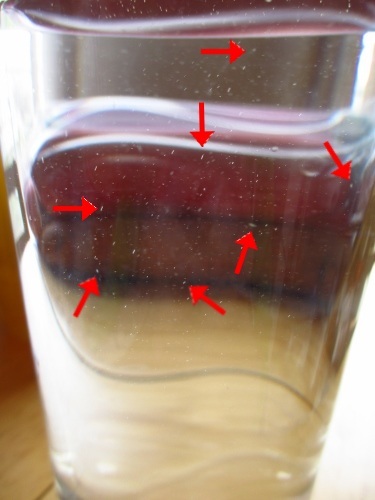 Firstly, random things floating in my water, more importantly, random things floating in my water that I can't identify just creeps and grosses me out! This is a glass of tap water from our kitchen sink. Thankfully we learned early on that Rockford city water is probably some of the nastiest water you can put into your body. The unfortunate thing with city water is it's pretty much all alike wherever you go; things like fluoride, lead and copper, bacteria, and sometimes even prescription medications, among many other things depending on where you're located, can be found floating in YOUR city water. My family and I have taken to getting our water at the local home environment center where it's treated, but unfortunately that can definitely get a wee bit pricey. If that's something not in the budget, a good water distiller can work wonders for your home and family's health! 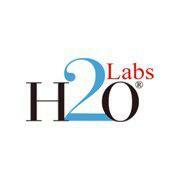 If you're not familiar with what these machines can do for you, learn more about water distillers from H2o Labs. As some of you may or may not know, the daily recommendation of water is around 6 to 8 8oz glasses a day. Some even go as far as to say you need to drink half your body weight in water daily! That's quite a bit of liquid to put into your body; wouldn't you rather those multiple glasses of water be bacteria and containment free? Having your own water distiller is not only healthy for you, it's cost affective and environmentally friendly. If you think about it, you're not spending so much $$$ buying bottled water every week, which still isn't that great for you to begin with, and you're not throwing away all those bottles that come in a case when you get done with them! All you need to do with a good water distiller is plug in and watch the magic happen! It truly pays for itself in the end. 1 winner will receive a countertop water distiller of their choice! 1. You MUST use the name and email you want to be contacted with in the Rafflecopter. 2. Contest will run from Monday, December 10th, 2012 to Monday, December 24th, 2012. 3. Open to US residents only, 18 years or older--Sorry everyone else! That's 2 mandatory entries + 45 possible extra entries which = 47 entries total! Disclaimer: I was not compensated for the above post. All opinions expressed in the above post are 100% mine and mine alone unless otherwise stated. This giveaway is open to US residents only, 18 years or older and will run from Monday, December 10th, 2012 12:00 pm central standard time until Monday, December 24th, 2012 11:01 pm central standard time. The winner will be chosen through Rafflecopter.com and be contacted within 24 hours of the drawing. Giveaway excludes Models 700, 1000 and 1500. You'll then have 48 hours (2 days) to claim your prize and send me all applicable information-If I haven't heard from you within that time frame, I will be forced to choose another winner. I'd choose the White Baked enamel100 with breakproof carafe. learned No other type of water filter or water purifier, including reverse osmosis or any other water purification system, can make water as pure. Bottled water is usually just plain tap water that has been minimally filtered to get rid of the bad odor and taste. http://denasstuff.blogspot.com/ placed your button here. Rafflecopter widget does not load - hope this is not over! Distilled water is the cleanest of all filtered water! I learned that filtered water can sometimes become more contaminated than tap water! wow! I learned once chlorine arrives in the home, it can negatively affect one’s personal appearance, comfort and long-term health. How uncool is that? Stainless steel model 300SS would be my choice. Thank you for the clean water giveaway! I would like the Convenient Easy-Fill Model 200 Home Water Distiller! I learned their system is the most effective in getting out the bacteria, pollutants and pharma! It's crazy what's in the water these days! Thanks for the giveaway to help improve our health! I learned that filter systems are not effective at removing viruses from water. it is not true that water is the best source of minerals for your body, which is FOOD not water. 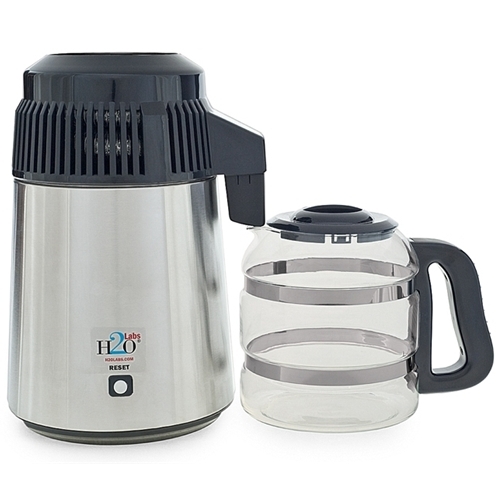 Stainless Steel & Glass Carafe Model 300SS seems like the best of the choices. Although, I must admit, I'm torn between that one and one of the white ones that would match the rest of my appliances. I learned that we get most of our minerals from food not water so its not a big deal distillers take out most of them. I think this would be awesome to have so I can provide my family with healthy water that has no pollutants in it! I learned that people get over 95% of the minerals they need from food, not water. 240V Stainless Steel UK Model 300SSE. Nice blog! I'd go with stainless steel. Stainless Steel & Glass Carafe Water Distiller – Model 300SS is the one I would want. Stainless Steel & Glass Carafe Model 300SS for sure! I learned that we get over 95% of the good minerals our bodies need from the FOODS WE EAT and NOT THE WATER WE DRINK. i learn they are the only ones whoe reverse osmosis!!! I would choose the White with Glass Carafe Model 300. I didn't know that it was even healthy to drink distilled water. I learned that the removed minerals bit is a myth. I learned that distilled water is the absolutely best water. Even bottled water is not the purest. Distilled is the best. I like the Stainless Steel & Glass Carafe Model 300SS. I learned that when water filter systems are clogged and not taken care of they can turn into breeding grounds for bacteria. I learned water distillers eliminate more contaminants filters. the 100SS stainless model is unique and cool! Stainless Steel & Glass Carafe Model 300SS. No other type of water filter or water purifier, including reverse osmosis or any other water purification system, can make water as pure. I learned that the Water distiller model 1000 is stainless steel and makes up to 8 gallons a day and has a 6 gallon reserve tank. Nice! Stainless Steel & Glass Carafe Model 300SS is what I would get. I would choose the stainless steel and glass carafe model 300ss. i learned that this system purifies water better than other home systems. It distills the purest water. I learned that regular water filters aren't enough - small contaniments can still get through. Yuk. That they can make up to 8 gallons a day, which would be great for our family of 6! My choice would be the Stainless Steel & Glass Carafe Model 300SS. Tap water doesn't contain all of the minerals you need. Combining minerals with distilled water makes them more effective. i would pick the stainless steel model, it makes me feel safer germ-wise. I would choose Stainless Steel & Glass Carafe Model 300SS if I won! I learned that water distillers eliminate more then ordinary filters! Hello Kayla! Thanks for this great giveaway. It's a sanitary and cost saving alternative to bottled or tap water. I would love to win the Stainless Steel & Glass Carafe Model 300SS model. Thank you and have a great day! I'd get the Stainless Steel & Glass Carafe Model 300SS! They have atuo on and off features which save energy! I learned that bottled water is usually just plain tap water that has been minimally filtered to get rid of the bad odor and taste. Stainless Steel & Glass Carafe Model 300SS would be wonderful. I would love the White with Glass Carafe Model 300 if I won. I learned once chlorine arrives in the home, it can negatively affect one’s personal appearance, comfort and long-term health. I didn't know distilling water could remove pharmaceuticals. I would like to have the 1000 model. Perfect for my family! Water Distillers and Water Distillation Systems from H2oLabs make the PUREST water possible to drink. I would choose the 240V Stainless Steel UK Model 300SSE! Definitely the 240V Stainless Steel UK Model 300SSE! I learned that they are manufactured in China! I would choose the 240V Stainless Steel UK Model 300SSE. I learned that you do not have to supervise the process. Just place the storage/collection container under the outlet spout before you turn it on. Just push the single button and forget about it. The unit automatically turns off when it has completed. I'd pick the Stainless Steel & Glass Carafe Model 300SS. I would get the Stainless Steel & Glass Carafe Water Distiller – Model 300SS -- looks like it would be easy to wipe off! I learned that it is the most effective at filtering water! I also learned that the process is similar to Nature's Hydrologic cycle and make it as pure and fresh as newly formed rain! I thought I liked the White baked enamel, but I may like the stainless steel with the glass carafe model a little better. I hadn't realized that regular distilled water could taste flat after sitting for a while, but they're fresh water made with the distiller wouldn't have that flat taste. I guess I didn't realize it came from sitting for a while. I like that the heating element is under the tank in the Convenient Easy-Fill Model 200 Home Water Distiller. Plus it sits on the countertop. Countertop Water Distiller Giveaway ends TONIGHT! I'll Be Right Back--Where's My Wine?! Owl Sound Keychain Giveaway ends TONIGHT! Worldreader's Mission & How YOU Can Help!